Our airport transfers to Courchevel will take you straight into the heart of the resort and take no more than two hours from either Geneva or Lyon when the roads are clear. Transfers start from 37.50€ per person from Chambery so simply fill out our Quick Quote calculator to find out more. In the meantime, we're proud to say that Three Vallee Transfers (3vt) have been offering airport transfers from Geneva, Lyon, Chambery and Grenoble Airports for the past fourteen years. 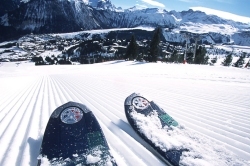 We specialise in the resort of Courchevel but also travel to Meribel, Mottaret, Val Thorens, Les Menuires and La Tania. We also carry out ski transfers from Moutiers Station liaising with the Eurostar from London and TGV from Paris. We supply private, door-to-door transfers, seven days a week throughout the year. Our fleet comprises of 15 Volkswagen Caravelle 4x4 minibuses and the smaller Audi A4 Allroad, the majority of which are brand new each winter. 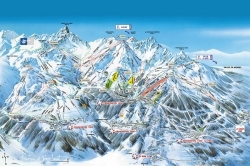 The linked ski area of the Courchevel valley is 1,304 acres of mountain entirely dedicated to all types of winter sports. Ski down the 150 kilometres of downhill pistes, served by 62 chairlifts, to get the most out of your day’s skiing. If you’re a beginner, the “ZEN” and fun zones are for you, with 27 green runs and 44 blue runs to get you skiing in perfect safety. For hardened skiers, 38 red runs and 10 black runs will test your technique and ability to the full! Whatever your level, choose your itinerary for some unforgettable days' skiing. The resorts of Courchevel 1550, 1650, 1850 and Le Praz are linked to the largest linked ski area in the world: the Trois Vallées, with 600 kilometres of prepared and maintained pistes. The magnificent scenery stretches from the Mont Blanc massif in the north to the Les Ecrins massif in the south. After a few hours on your skis and you'll reach the summit of the the Trois Vallées massif, the Pointe de Thorens (3266 m) at Val Thorens. 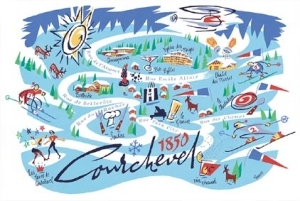 If you're curious as to what people are saying about Courchevel as we speak then we've included the following Twitter feed for your viewing pleasure. If you're wanting to keep up with all of our latest offers you can simply follow us on Twitter too via @3vtweet. Courchevel's nightlife is almost as exhausting as its mountain pursuits! There's a wide range of restaurants, bars and cafes to keep you well fed and watered. There's also a plentiful array of opportunities for hours of entertainment in the evening. The four levels of the resort each have there own ambience and you’ll find yourself spoilt for choice!